It’s one of the most common dilemmas facing plant-based and vegan eaters, and a question I get all the time: How do I relate with my non-vegan partner and family members? What can I do to make sure I stay on track and even perhaps encourage my loved ones to follow me down the plant-based road of healthy eating? I wish I had a quick and easy answer for you, but the reality is that there’s simply no one-size-fits-all answer. 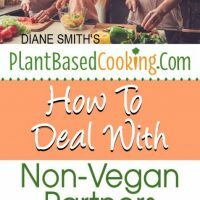 Each individual plant-based vegan eater is ultimately going to need to navigate the particulars of his or her unique family situation, with all the individual quirks and personalities involved, and balance that against his or her own unique personalities, tendencies and values. While there are some general principles that can apply across the board, trial and error is the way to figure out what works best for you, your partner, and your family. And, as they say, if at first you don’t succeed, try and try again – because you and I both know that your plant-based diet needs to succeed over the long haul! With that being said, here are some overarching perspectives for dealing with non-vegan partners and family members. Hopefully, some or all of these suggestions will resonate and will foster an environment of love and well-being in your home. It can be so tempting to want to share the joy and enthusiasm we feel about our plant-based vegan lifestyle that it can be hard sometimes to restrain ourselves and not go overboard. But just remember that before we are vegans or vegetarians, flexitarians or paleo, before all those labels that put us into ever so many boxes, we are all people, with the exact same core needs for respect, understanding and consideration. No one, no matter what they eat, likes being preached to, lectured to or talked down to, and you’ll need to find a way to share your plant-based ideas and insights with respect for the current choices and preferences of those around you. You want the support of your loved ones, or at the very least, their respect and accommodation – so you’ll need to offer that in return. The quickest way to make your loved ones tune you out when you talk about your vegan lifestyle is to judge or moralize to them about their eating habits. Share your enthusiasm, in moderation, paying attention to when the other person has heard enough and making sure that you convey that you honor where they are just as you want them to honor you and your path. It’s fine to offer plant-based information and resources in the form of websites, books, articles and films, but be sure not to push, and be sensitive to the receptivity level you find. You never know when someone will get curious, but if you bombard them, that natural curiosity is so much less likely to arise. Peace is also a value. For the sake of your family and guests, whatever you do, don’t turn the Thanksgiving or Christmas table, or that July 4th barbecue, into a debate about food. Don’t argue about food in front of your children. DO have a thirty-second plant-based “elevator pitch” prepared for when someone around you is curious. 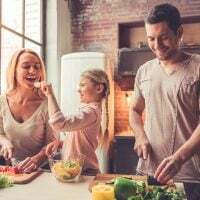 There are some things you can do on a practical level to make mixed plant-based vegan and non-vegan family life go smoother. • When eating out, check the menu beforehand and make sure that there are both suitable plant-based vegan and non-vegan options. You should be able to find restaurants that work for everyone. • Clarify together what food will be stored where, and who will cook what food items. Some vegans won’t mind cooking meat or dairy for their family members or seeing raw meat every time they open the fridge, while others will. Decide what your tolerance levels are and negotiate from there. Realize, of course, that as long as you’re living with or closely relating with others, there may be a need for compromise. Remember that you value these people and the ways that these relationships enrich your life. Healthy eating is very important, but so is love and connection. The bottom line is, as important as a plant-based diet is, don’t lose sight of other things that matter. • Encourage whoever is cooking to start with a plant-based option for at least one dish out of each meal that you can enjoy, and then they can add animal products to the dish for whoever prefers that. That way you’re all kind of sharing at least one item, and it’s also an efficient use of time, supplies and resources. • If the smell of meat, poultry or fish cooking is problematic, be upfront about that. If you have a sensitive nose, odors can be hard to tolerate, and you don’t need to suffer in silence or feel uncomfortable in your own home. See if you can negotiate times for your partner or teen to cook the offending items when you’re not home. For instance, during your workday, or perhaps you can schedule your grocery trips or workouts at predictable times so your loved ones know their window of opportunity and it becomes routine. And be sure to request that when others are cooking animal products that they turn on the overhead fan. 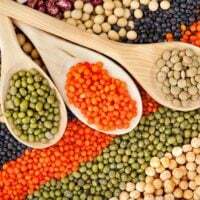 • Meat substitutes can be worth a shot. Although highly processed, plant-based foods such as the traditional frozen veggie burger or the recently-introduced Impossible Burger can be useful in a “mixed” diet family setting and might work as a meal you can share together. Try out different brands and see which ones are the family favorites. When all is said and done, maintaining your whole foods plant-based vegan diet is your choice and your responsibility, so why not set yourself up for success by making life as easy for yourself as possible? 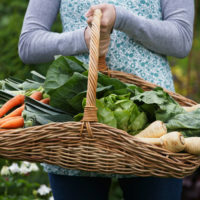 Keeping a steady supply of your own plant-based food available at all times will help keep your blood sugar balanced and lessen the temptation to “cheat.” For instance, keep fresh carrot, celery and cucumber sticks and hummus or some other plant-based dips in the fridge at all times. Kale chips, nuts and seeds, and nut and seed butter is also great for balancing blood sugar on the fly. Crock pots are a convenient way to prepare delicious, healthy soups and stews – and these can be as simple or as complicated as you want. Be sure to make extra of whatever you’re cooking and freeze the leftovers to enjoy when you need them. 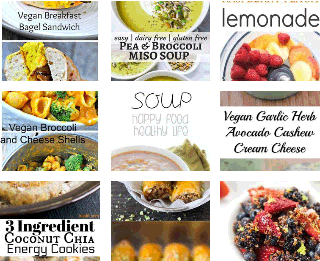 Check out my article, “Staying Motivated on a Plant-Based Diet” for other great ways to support your healthy, whole foods vegan eating, such as visualizations, affirmations, skillful use of willpower, and even TED talks. Of course, there may be times when you find yourself wishing that you lived in an exclusively whole foods plant-based home. 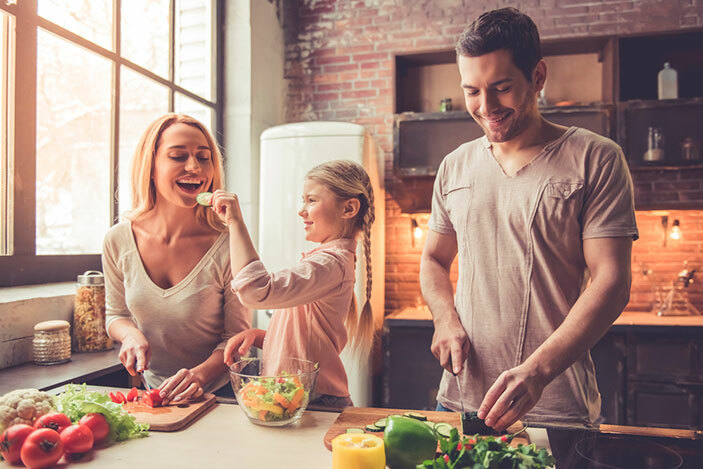 The reality is that a shared plant-based vegan and non-vegan family situation can pose some challenges. Make the best of it by trying out different solutions, keeping an open mind, staying positive, and focusing on the love that you share. You are indeed what you eat, but you and your loved ones are so much more than that! thank you so much for your ideas. Lead by example is what i have found – works best. Instead of Doctor appointments for PILLS – I have spa appointment . I am presently going through my recipes – PLANT BASED and I am offering a type of TAPAS TRAY option for everyone to pick from. If I make chili for instance – I will make a Plant based option – but name it something that is intriguing and directed to the plant based eater just as I have always created a HOT POT of peppers etc – for those who love heat – to add to their chili. I believe that I have the right to eat the way I want to without having to justify WHY – so I have to allow for the CARNIVORES to do the same – and once they see the GLOW – they will change – it might take time – but worth spending time cooking rather than converting. My thoughts – and it seems to be working – as more and more people now come to me – to ask questions. Enjoy a plant based glass of wine and be thankful that we have the internet to connect with like “Health/minded eaters”. I have been leading for over 40 years and thank goodness my adult children have caught on and ask me for recipes. Thank so much for your insights. I’m so glad it’s working for you and I love what you said, “…once they see the GLOW – they will change.” Lead by example, perfect. ???????? I wish I could be more involved with creating different better meals.. I do have at least 4/5 good fresh meals that I enjoy making (1 being a good old roast dinner) I could make with my eyes closed (I’wouldn’t actually do that!) but it’s like my brain is programmed to make what I know because they’re easy and my family enjoys them.. I bought leeks the other day as I thought ‘I’d chuck them in with that as there like onions for a change.’ They didn’t get used.. just grew then I binned them.. I hate waste.. that’s also why I don’t venture into buying different foods! W. I love your ways of thinking. I need to get more goodness into my life. And ultimately my family. 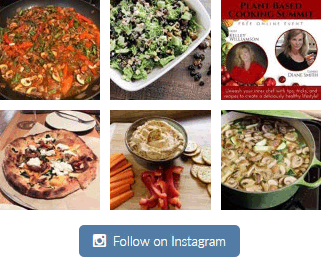 Hey Mary, I know meal planning can be a challenge and while it’s easier to stick with what we know after you’ve practiced making new recipes and planning plant-based meals, you will find it easier. It’s just the way our brains work and your right, your brain is programmed in a sense with what you’re familiar with. So, if you keep at it, you’ll be easily making plant-based meals and plans before you know it!